You'll be £8.00 closer to your next £10.00 credit when you purchase Villager Jim's Garden Wildlife. What's this? Birds, bees, and a whole host of other flora and fauna that share Villager Jim’s garden in the tiny Peak District village of Foolow, are featured in this stunning book of photographs. Bobbin Robin is just one of the regular visitors to the garden; she and her friends have a huge social media audience, with tens of thousands of viewers. Open up the book to see the daily goings on of these wildlife friends in some of Jim’s very best pictures taken in this beautiful setting. They illustrate the close relationship Jim has formed with some of the regular wildlife visitors to his garden. His quirky captions capture the mood and spontaneous character of each individual shot and are an essential element of what makes Villager Jim’s pictures so special. This is such a cute book! The photography is really well done, and I am so jealous of Villager Jim’s garden and all the amazing creatures he gets to see! The captions for the photos in this book are hilarious and sweet, and I found myself smiling every time I turned a page! It is so wonderful to see someone who is so in tune with nature, and the respect he has for all living things is just nothing short of amazing! Wonderful book for wildlife/garden/environment lovers! ★★★★★ Villager Jim's Garden Wildlife is a photography book that captures a very British country garden and its regular inhabitants. So regular, that many of the birds are named. While the subjects are ordinary, the pictures are anything but. The pictures are beautiful and very inspiring. Especially, for some of us amateur photographers that feel we run out of subjects. While this is obviously not the average backyard, it truly inspires to dig deeper into into my own garden and perhaps work on my patients rather that constantly migrating for new places to photograph. Over the past few years, Villager Jim has been avidly photographing wildlife in his own garden as well as in the beautiful countryside that surrounds his home. 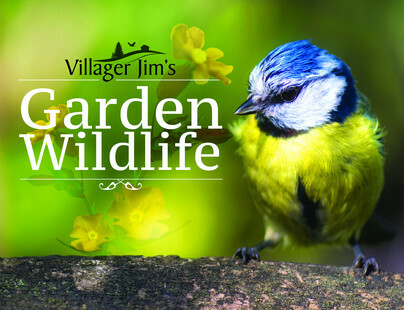 Birds, bees, and a whole host of other flora and fauna that share Villager Jim's garden in the tiny Peak District village of Foolow, are featured in "Villager Jim's Garden Wildlife" which is a truly stunning book of beautiful full color photographs. Bobbin Robin is just one of the regular visitors to the garden; she and her friends have a huge social media audience, with tens of thousands of viewers. Now anyone can open up "Villager Jim's Garden Wildlife" to see the daily goings on of these wildlife friends in some of Jim's very best pictures taken in this beautiful setting. They illustrate the close relationship Jim has formed with some of the regular wildlife visitors to his garden. His quirky captions capture the mood and spontaneous character of each individual shot and are an essential element of what makes Villager Jim's pictures so special. While unreservedly and enthusiastically recommended for both community and academic library Contemporary Photography collections, it should be noted for the personal reading lists of both photography fans and gardening wildlife enthusiasts that "Villager Jim's Garden Wildlife" is also available in a digital book format. A beautiful book with no other aspirations than to gather in it a splendid collection of wild animal photographs for our personal enjoyment. The Garden book is based around Jim's garden and follows the same format. The photographs of garden birds are some of the best I have ever seen and other wildlife are also present. This book made me want to visit Jim's garden, the glimpses of it are tantalising. Put simply, this volume is a collection of pretty animal, insect and bird photographs. It is likely to appeal to readers who like such pictures (especially as they are of ‘British’ creatures), and who aren’t interested in the ‘technical’ details concerning them. Fans of specific bird and animal species may also find the photographs worthy of perusal. Expatriates wishing to recall the ‘creatures’ of their childhoods (or to show their children or grandchildren) may also find it of interest. Over the past few years, Villager Jim has been avidly photographing wildlife in his own garden as well as in the beautiful countryside that surrounds his home. Amongst the subjects in his vast collection of images are adorable pictures of his Labrador dogs, as well as farmyard animals – including the ever-popular long-horned, curly-coated Highland cattle – and the flora, fauna and spectacular landscapes of his beloved Derbyshire Peak District. His passion for the quirkiness that the natural world offers sees him venturing out most days with his camera during the hours of dawn and dusk.